WMAP First-year Paper Figures, M.R. Nolta, et al. Individual figures are provided for use in talks. Proper display of PNG transparency in PowerPoint requires saving files to your computer before Inserting them. Please acknowledge the WMAP Science Team when using these images. Gravitational potential Φ as a function of redshift z for a variety of cosmological models. The models are normalized to unity at z = 0. Adopted dN/dz model (RLF1) for the distribution of NVSS sources from DP90, normalized to integrate to unity (left panel). 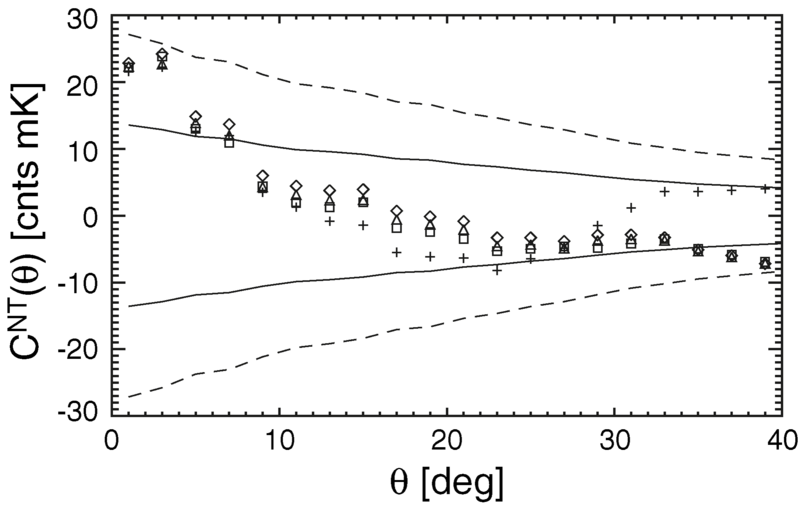 The small blip at z ≈ 0.05 is spurious and is due to breakdown in the DP90 fitting function. Also plotted is the ‘‘luminosity/density evolution’’ (LDE) model also from DP90, which is a poor fit to the observed ACF (right panel). WMAP-NVSS CCF. The CCF is insensitive to the details of the declination correction. Two simple methods are compared; both broke the sources into sin (δ) strips of width 0.1. The first (diamonds) subtracted the mean from each strip. The second (triangles) scaled each strip by the ratio of the global mean to the strip mean. The cross points are uncorrected, showing the correction is only important for θ ≥ 25. We used the WMAP ILC CMB map; substituting the map of Tegmark et al. (2003) instead produces the same results (squares). The solid and dashed lines are derived from the diagonal elements of the correlation matrix because of accidental alignments; they would be the 1 σ and 2 σ contours in the absence of off-diagonal correlations. The points, however, are highly correlated, as shown in Table 1. Effect of varying ΩΛ on the CCF. In all panels we assume a flat universe with fixed ωb, and trade off between ΩΛ and h by keeping the combination Ωmh3.4 constant; when ΩΛ = 0, h = 0.48. 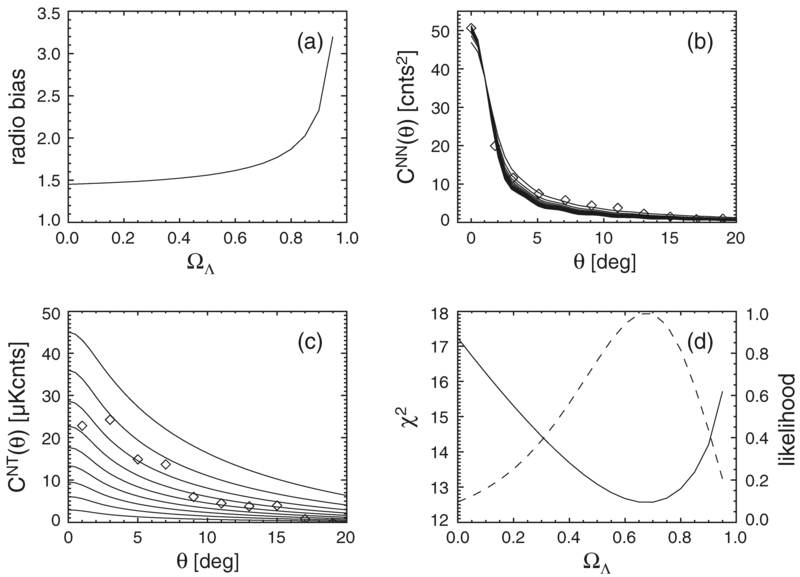 Panel a shows the inferred radio bias as a function of ΩΛ. Panel b shows the bias-corrected NVSS ACF compared with the measured ACF. 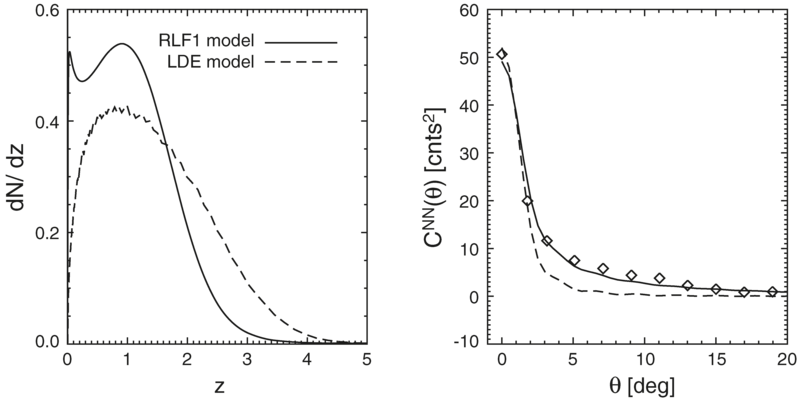 Panel c shows the predicted CCF for a range of values of ΩΛ, compared with the measured CCF (diamonds). 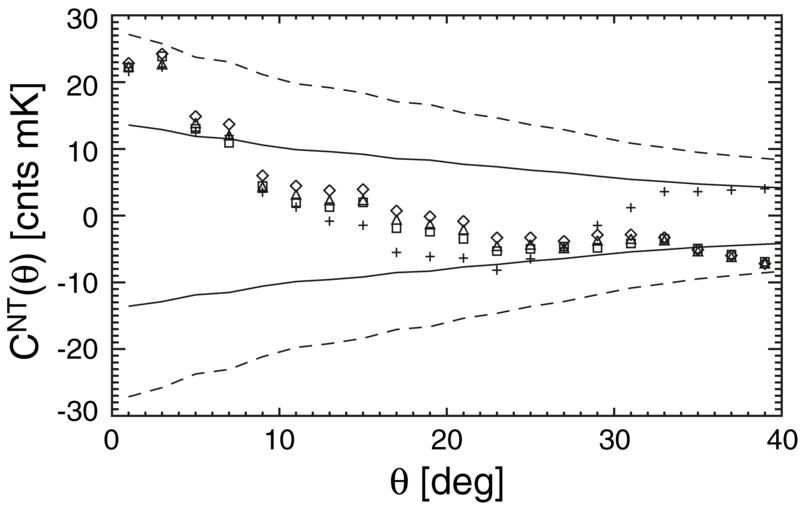 The amplitude of the predicted CCF is proportional to ΩΛ, which is stepped in increments of 0.1 from 0.0 to 0.9. Panel d shows the Χ2 of the model CCF as a function of ΩΛ. The Χ 2 was computed using the first 10 points of the CCF (0° < θ < 20°) and Table 1. The minimum Χ2min is 12.5 at ΩΛ = 0.68; at ΩΛ = 0, Χ20 = 17.2. 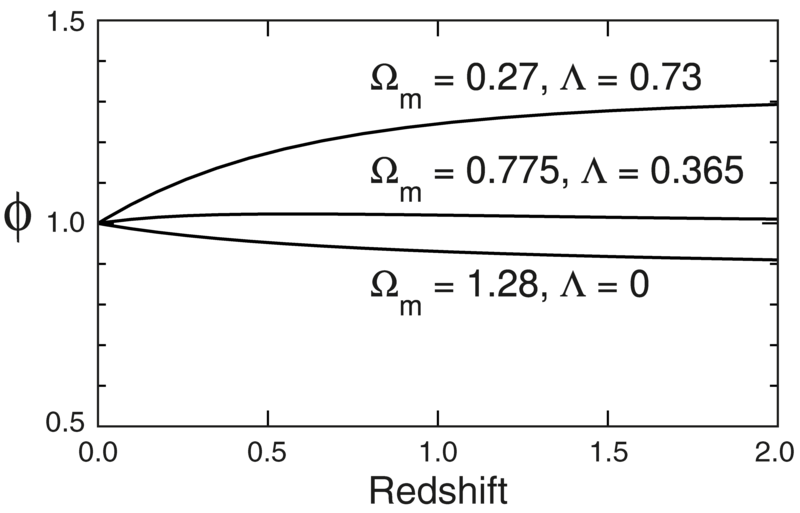 The dashed line is the likelihood ∝ exp(- Χ2/2). The 1 σ limits are 0.42 < ΩΛ < 0.86.